.... and in the blink of an eye (not quite!) another wee scrappy pouch emerged from the sewing machine! Lovely pouch received and another made with those HST scraps. 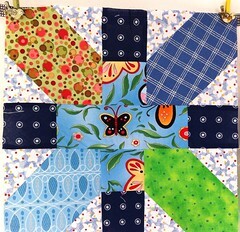 And a huge thank you for showing my Siblings quilt. 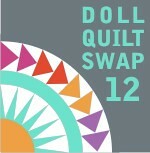 I can't wait to hear how many quilts actually get made for this summer. What a lovely post filled with eye candy! You've made my afternoon bright and shiny! Oh you scored with that pouch and notebook!! Fancy coming to do my cleaning?! I love the pouch and notebook you received - she got you spot on! I also love your blocks and triangle pouch - what great idea! Gosh - that HST pouch is adorable! I must hunt out my scrappy HSTs. Thank you for the blocks - they are beautiful Karen. So glad you liked your package! 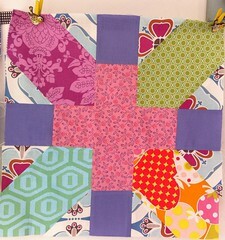 Your x and + blocks are great and I am in love with your scrappy pouch! 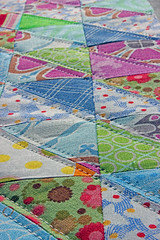 I love what you did with the triangles...that pouch is so sweet! You got a beautiful pouch! An Irish Road Trip: Giveaway greetings!